Christmas lists are being made and you can surely bet there's a hoverboard on those lists far and wide. I know my kids have both been asking for one ever since they first came out. Of course with the high prices that came with them I had to say no...at least until the prices came down. Now that they've been out for a while the prices have come down and they are way more reasonable. So I'm sure there will be lots of kids asking for them this year that may actually even get one. The good people over at GOTRAX™ are even making the deal sweeter for a limited time with their hot introductory pricing so now's the time to buy! The GOTRAX™ GALAXY is beaming down its signature UL certified hoverboards, the HOVERFLY and HOVERFLY PLUS. These stellar self-balancing scooters allow Commanders to accelerate, stop and steer with a simple shift in body weight using advanced gyroscopic technology. Commanders can experience the zero-gravity feeling of hovering as they cosmic fun glide through the GALAXY. Not in the budget this year? I still have you covered because I have two ways you can enter to try and win a GOTRAX Hoverboard! Visit the giveaway HERE on my blog, or HERE on the GOTRAX website. I have to admit they are cool looking.I see a kid ride one of these all he time on our street. It is neat how it lights up- I can see the kid riding it at night down at the end of the block It goes pretty fast too. This would be awesome to get my kids have never had one & I know they will love it. This looks like a lot of fun to ride around on but I'm afraid I'd fall and break a hip! This looks like a fun ride, but be sure to pad-up and wear a helmet! I have no balance when it comes to these kinds of things. They do however make a kit that can turn pretty much any hoverboard into a go cart. There is a kid down the street who has one of these. He makes it look so simple! I can't even skate or skateboard but I would love to try one. I think this is the gift that could be for that hard to buy for person. I love this! Such fun. This hoverboard looks very fun. Thanks for sharing! These are really starting to catch on. I think it's time to seriously consider purchasing one for Christmas. Who hasn't wanted some kind of hooverboard since Marty McFly! This is cool! This looks like a lot of fun but I don't think I could ever balance enough to get it going without falling off. But my kids would love it! I had to drive on OSU's campus last week and was waiting for a light to change when in front of me one of the students rode across on a hoverboard - I had not even noticed him waiting on the corner he was so evenly balanced that when the light changed he just floated across. My neighbor has one and I see him going up the street on it all the time and it looks like fun . 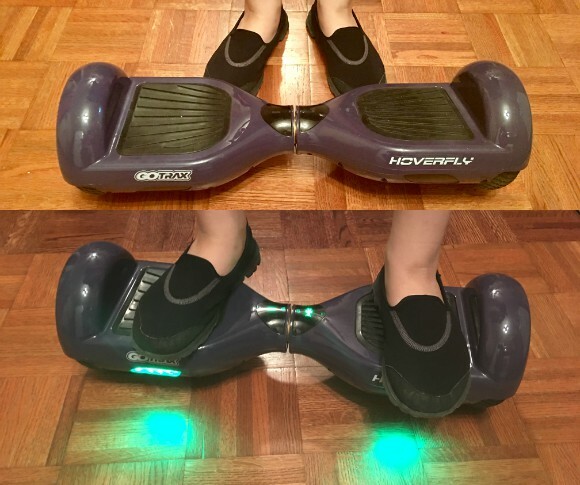 These hoverboards would make great gifts this holiday season. My neighbor kids have these and they love it! My son really wants one as well. My grandson wants one of these so bad. I am just afraid he will get hurt, but he has good balance, so he will probably get one for Christmas this year.